Van der Salm Boskoop operates eight sites across the Netherlands and one in Portugal. The company’s product range includes the following varieties: Lavandula, Buxus, Gaultheria, Picea glauca, Pinus pinea, Ilex crenata and Deco Fruit. Van der Salm Boskoop is certified under the two main Dutch quality assurance schemes for the floriculture industry: MPS-GAP and MPS-SQ. Ruud Veelenturf, who is in charge of cultivation processes and certification at Van der Salm, is pleased with the initiative to introduce a single, standardised MPS vignette, as this helps to create transparency in the floriculture industry. The specially created platform http://followyourflowerorplant.com gives breeders and growers the opportunity to inform consumers about their production methods. Consumers are increasingly demanding information about the origin of the products they select and purchase, and sustainability is one of the criteria that plays a role in this selection process. This is one of the reasons Veelenturf fully endorses MPS-ProductProof: it simplifies his work, as it reveals which active ingredients are not present in and on the floriculture products. ‘It is an extra tool for us to demonstrate that our products are clean.’ The independent sampling, with results that are available to all interested buyers, provides consumers with the certainty that they have made the right choice. It also provides a legal cover in cases where public bodies might present incriminating evidence. 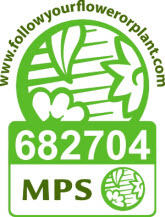 If all retailers were to routinely use MPS-ProductProof instead of relying on the extensive restriction lists currently in place, this would mean further progress as far as sustainability in the floriculture is concerned.